“Taking a leap of faith always involves a certain amount of terror on behalf of the one leaping. In the new solo show “Perfectly Flawed” at New York City’s Gallery Hanahou, the one taking the plunge is Swedish artist Stina Persson who abandons her digital safety net to create unaltered works that are beautifully perfect – or imperfectly beautiful – and as a result soars. “I’m so used to not being allowed to make any mistakes, that when I finally am, it’s difficult to accept them,” Persson says at the opening at Gallery Hanahou, glancing at one of her paintings where the watercolor has been allowed to leave a long, runny streak. 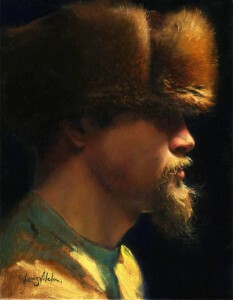 According to Nakano, people of different background fall for Persson’s work. Persson’s females – and they are only females – are inspired by the 1970’s when authenticity was the commandment and battle songs were sung around the camp fires. Persson’s women need no botox. Proud and beautiful they look up and ahead – unaware, or perhaps not caring about, their slight imperfections. They know, as we all do deep inside, that it’s the imperfections that make us interesting and human. 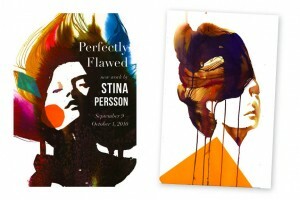 “Perfectly Flawed” runs through October 1. For more information: Gallery Hanahou, 611 Broadway, New York City.